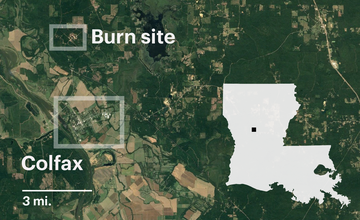 COLFAX, Louisiana — Two years ago, the U.S. military had an embarrassment on its hands: A stockpile of aging explosives blew up at a former Army ammunition plant in Minden, Louisiana, sending a cloud of debris 7,000 feet into the sky. This story is part of a series examining the Pentagon’s oversight of thousands of toxic sites on American soil, and years of stewardship marked by defiance and delay. Read the first entry in this series. Local residents, alarmed by toxic contaminants from the accident, were nothing short of furious when they learned what the military intended to do with the 18 million of pounds of old explosives still remaining at the depot. The Army was set to dispose of the explosives through what are known as “open burns,” processes that would result in still more releases of pollutants. Facing an uproar, the Army turned to a familiar partner to help placate the residents of Minden: A private facility in Colfax, 95 miles south, operated by Clean Harbors, a longtime Defense Department contractor and one of the largest hazardous waste handlers in North America. The Colfax plant is the only commercial facility in the nation allowed to burn explosives and munitions waste with no environmental emissions controls, and it has been doing so for the military for decades. And so while the Army ultimately commissioned a special incinerator to dispose of most of the Minden explosives, more than 350,000 pounds of them were shipped here. 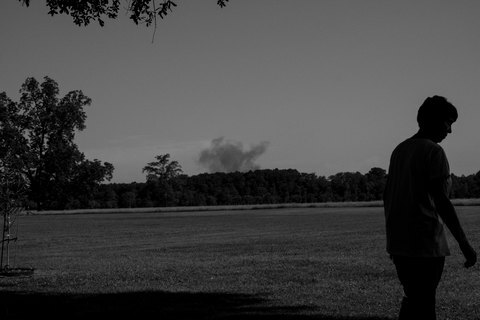 Over the ensuing months, the munitions were burned on the grounds of the plant, fueling raging fires that spewed smoke into the air just hundreds of yards from a poor, largely black community. Beyond the story of the Minden explosives, the Clean Harbors facility here has become an important clearinghouse for military-related waste as the Department of Defense and its contractors struggle to deal with hazardous byproducts from weapons manufacturing and huge stockpiles of aging munitions. For years, defense-related firms have burned this waste at their own facilities, stubbornly clinging to the practice even as it has been outlawed in parts of Europe and Canada. But the permits to do so have become harder to get, the terms less flexible, and, increasingly, the pollution unacceptable to surrounding communities. Clean Harbors offers a legal way to get rid of dangerous materials from a wide range of sites that can’t or don’t want to handle them on their own. Explore every shipment of hazardous waste that was sent to Colfax in 2015 and burned or detonated into open air. Explore the graphic. In 2015 alone, 700,000 pounds of military-related munitions and explosives were trucked to Colfax, where both Clean Harbors and the military have so far been able to outmaneuver a community with abundant concerns but little money, and even less political influence, to fight back. The Department of Defense did not respond to questions regarding its use of the Clean Harbors burn facility in Colfax, or environmental concerns related to it. That such material is being shipped anywhere appears to contradict the military’s longstanding claim that these wastes are too dangerous to move, so they must be burned in the open where they were made or used. 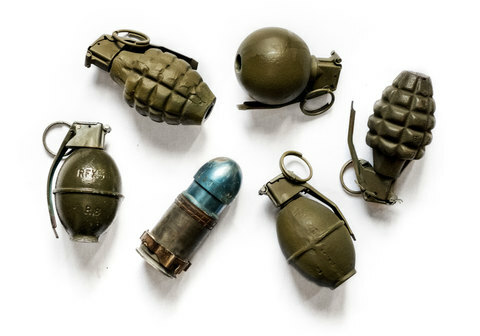 Yet every year, military bases and defense contractors send munitions or other explosive material to Colfax, packing explosives into cardboard boxes, shuffling them onto 18-wheelers and driving them sometimes thousands of miles across the country. Delivery manifests filed with Louisiana regulators detail the variety of materials: rocket fuel from a missile factory near Los Angeles; hand grenades from a munitions factory in Arkansas; detonating fuses from Cincinnati; solid propellant from an Aerojet Rocketdyne factory in Virginia; explosive lead from a North Carolina military aircraft factory; warhead rockets from a Lockheed Martin facility in Alabama. Once received, they are burned on a set of 20 metal-lined pans on a parking-lot-like patch of concrete with “no risk to human health or the environment,” according to Clean Harbor’s senior vice president for compliance and regulatory affairs, Phillip Retallick. The burns take place several times each day, and when they do, they turn parts of Colfax into a virtual war zone. “It’s like a bomb, shaking this trailer,” said Elouise Manatad, who lives in one of the dozen or so mobile homes speckling the hillside just a few hundred yards from the facility’s perimeter. The rat-tat-tat of bullets and fireworks crackles through the woods and blasts rattle windows 12 miles away. Thick, black smoke towers hundreds of feet into the air, dulling the bright slices of sky that show through the forest cover. 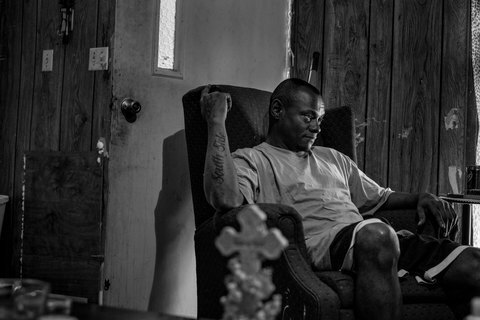 Manatad’s nephew Frankie McCray — who served two tours at Camp Victory in Iraq — runs inside and locks the door, huddling in the dark behind windows covered in tinfoil. Like most of the people who live there, Manatad and McCray find it difficult to believe the booms and clouds aren’t also exacting some sort of toxic price. Frankie McCray, a veteran who served two tours in Iraq, hides inside his trailer on Bush Road in Colfax when the open burning of munitions takes place nearby. Today the town amounts to a smattering of collapsing historic buildings peppered with two gas stations, a bait and tackle shop, a grocery, a hardware store and a pharmacy where locals gab around a lone red 50s-era diner table with 10-cent cups of coffee. Ever since highways replaced the river barges it’s been difficult to build an economy here, and the average Colfax resident earns about $13,800 each year. Last November, state environment officials parked an air monitoring van on Bush road a few doors down from Elouise Manatad’s trailer. Manatad says they never told her what they were doing or what they’d found, but lab samples obtained from the state show environmental regulators detected notable levels of acrolein, a highly toxic vapor commonly associated with open burns of munitions. A division of the U.S. Centers for Disease Control and Prevention describes acrolein as having a “suffocating odor” and causing severe respiratory problems and heart attacks — even at low doses and for as long as 18 months after exposure. Soil, groundwater and stream beds sampled on the Clean Harbors site over the past few months have also been found to contain an array of extremely harmful substances likely connected with the burning of munitions waste. Underground water supplies sampled this spring show perchlorate, a type of rocket fuel, at more than 18 times Louisiana’s trigger levels for additional screening and eight times greater than what California, which sets stringent regulatory limits on perchlorate in groundwater, permits. RDX and HMX, both military explosive compounds, were also detected. Soil tested near the fence line of the facility contained dioxin — a chemical that builds up in fish and affects the human immune, reproductive and nervous systems — at three times the limits that trigger a state safety review. Silt scraped from a stream bed that runs toward the plant’s fence line and a nearby farm contained lead at nearly four times the level that triggers additional state screening. State inspections also found Clean Harbors in violation of a number of regulations, including handling hazardous waste in unpermitted ways, failing to make repairs to its burn pads, and discharging unauthorized pollutants in violation of its state water permit. The burn facility first opened in Colfax more than 30 years ago, and Clean Harbors acquired it in 2002 from a company named Safety-Kleen. Retallick says today it’s a squeaky-clean operation, and he dismisses the contaminant findings. The acrolein and benzene were caused by something other than the facility — probably truck traffic or barbeque fires, he said, noting they were detected in background levels the state measured on days without burning. The other contaminants are either contained within the 740-acre Clean Harbors property, or exist at such low concentrations they don’t pose a risk. 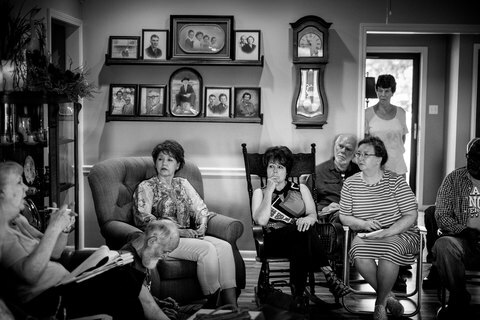 Brenda Vallee, a resident of Colfax and an environmental activist, watches from her home as a plume of smoke floats above the Clean Harbors plant. State health department officials bolstered this view when they analyzed the air sampling data — including the acrolein and benzene — and concluded in February that though the findings are “based on a small number of air samples collected over a short period of time and may not reflect actual long-term exposures … the results do not indicate a likelihood of adverse health effects.” State environmental officials are still analyzing the water and soil samples, including the dioxin and lead detections, and but told ProPublica that they expect that by the time those concentrations are likely to be ingested by people, they would be so diluted as to pose no threat. “The groundwater is restricted to a relatively small area buried within the heart of the facility,” said Gregory Langley, a spokesman for the Louisiana Department of Environmental Quality. The state is pressing Clean Harbors to correct that pollution on its site, but still, he characterized the findings as “not much of concern” to the surrounding residents. The local Clean Harbors office here in Colfax is located in a double-wide trailer just outside of town. Inside the trailer, a map of the United States hangs on one wall, with strings pinned from at least 42 locations across 22 states, representing U.S. military facilities or defense contractors that ship explosive-laden waste here. Clean Harbors, based in Massachusetts, won’t say how much the Pentagon pays it to burn its explosives, but it’s likely just a sliver of the company’s continent-spanning business, which brought in $2.7 billion in revenues in 2016. In a normal year, Retallick said, defense-related waste may account for less than a third of the Colfax plant’s business. He blames the controversial offloading of explosives from the Army at Minden for disturbing the company’s otherwise low profile. Many of the black residents living close to the plant see the history differently. They say they have for years harbored concerns over their health. Manatad suffers from recurring strokes and respiratory infections. She says at least five of her neighbors have thyroid disorders, a condition that has been linked to exposure to perchlorate. Residents gossip about former burn facility employees who died of cancer. When the Minden shipments began, out-of-town activists who opposed the large-scale explosives burns in the northern part of the state came to Colfax and found an organized, vocal audience among the community’s leaders. Some at the meeting, including its host, also suffer from thyroid disorders, and they’ve pressed for months for tests of the air and water around the plant, and for Clean Harbors to install an incinerator to contain the smoke. 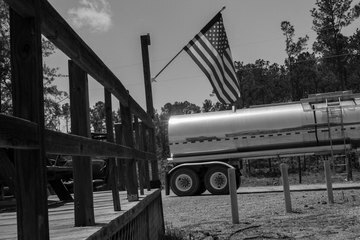 “They told us they weren’t breaking any laws and they didn’t want to spend the money,” said Wilma Subra, an activist and environmental scientist who often takes up Louisiana contamination concerns. Brown, the state representative, says he doesn’t believe Clean Harbors would have remained here all these years if Colfax weren’t an undereducated, low-income community. Last year, short on patience, Brown took what seemed like the only remaining step: He sponsored a bill to ban open burning of hazardous waste in Louisiana outright. “Overwhelmingly, people were in favor of it,” he said. Then, said Brown, “They brought the brass.” A high-ranking officer from Louisiana’s Fort Polk — which also burns explosives with its own federal hazardous waste permit — came to Baton Rouge with a team of lawyers and public relations professionals. They argued that the burns were part of essential training for U.S. soldiers whose lives would be on the line in Iraq if they didn’t know how to detonate their munitions. “You have to be able to carry out the training mission,” said Stanley Rasmussen, director of the Army’s environment and energy office for a nine-state region including Louisiana, who met with legislators over the bill, and confirmed the account to ProPublica. There is no bigger heavyweight in Louisiana than the Department of Defense. It drives much of the state’s economy and employs more than 80,000 people. The Army lined up against Brown’s bill, demanding an exemption. It got what it wanted: Brown, relenting, drew up an amendment permitting the military to continue to burn if the bill passed. “I knew if I didn’t have the military,” said Brown, “I would lose everybody.” But the tide had already turned. A photographer who covered the war in Iraq appreciates how threats can come to seem routine. See the photos. 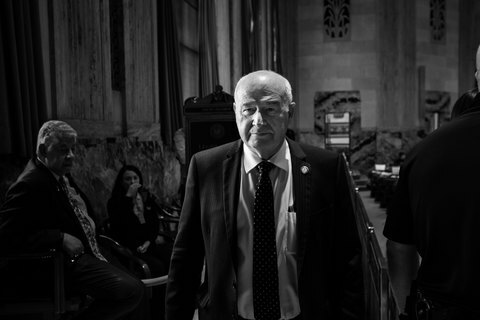 Clean Harbors spent 60 days with legislators in Baton Rouge arguing, as Retallick put it, “to help them understand the science.” The company offered to pay for a sewer infrastructure project in Grant Parish, which Brown declined. (Retallick said Brown asked for it, then declined.) Clean Harbors also offered to install fence line air monitoring systems at its facility in Colfax, which the state accepted, and it has recently put in. (Environmentalists say the monitoring will miss the black smoke they see floating high in the air). Ultimately, the company seemed to convince the legislature that Brown’s concerns were irrational. Neither the Louisiana Chemical Industry Alliance nor representatives from Southern Strategies, the lobbying firm hired by Clean Harbors, responded to requests for comment for this story. In Colfax, the fight endures. The state is pressing for more water and air samples. It is threatening Clean Harbors with sanctions for some of its violations. Its health department has promised to continue watching the issue. But almost nobody — especially Manatad and others living pressed up against the Clean Harbors fence line — expects officials to force Clean Harbors to stop burning altogether. 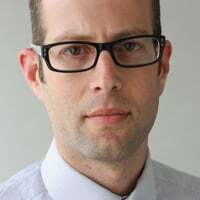 Abrahm Lustgarten is a senior environmental reporter, with a focus at the intersection of business, climate and energy. Nina Hedevang, Razi Syed, Clare Victoria Church, students in the NYU Arthur L. Carter Journalism Institute graduate studies program, contributed reporting for this story. Other students in the program who also contributed were Alex Gonzalez, Lauren Gurley, Alessandra Freitas, Emma Cillekens and Eli Kurland.